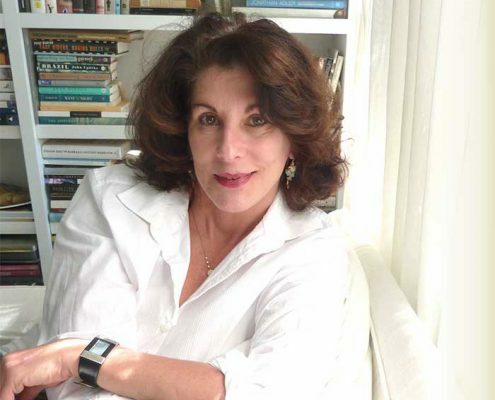 Transitional and contemporary interior design are imaginative hybrids of traditional and newer elements that are skillfully combined so that rooms feel welcoming and fresh. 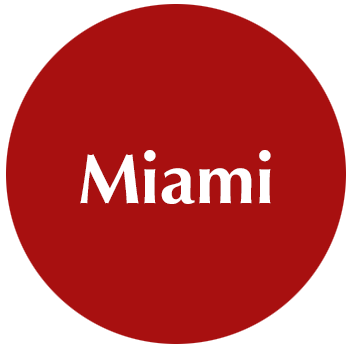 The sleek lines of modern design are replaced by rounder, softer, yet clean shapes. 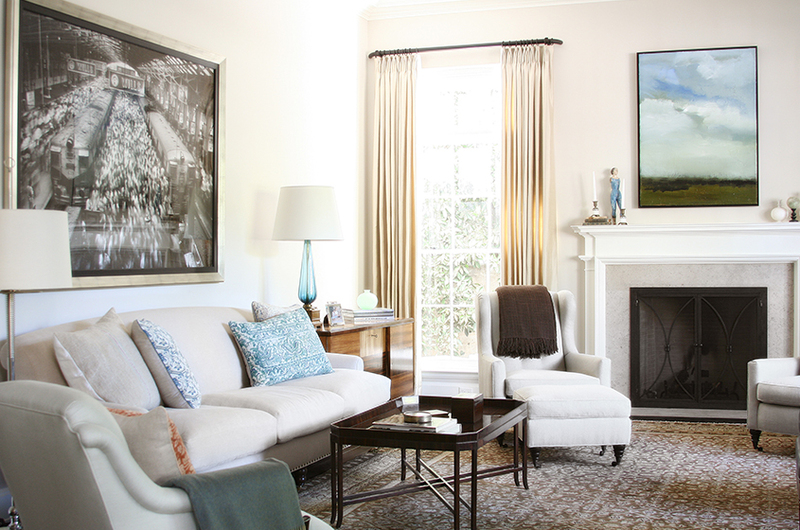 Often the color palette is more neutral with added bursts of color through accessories or art. 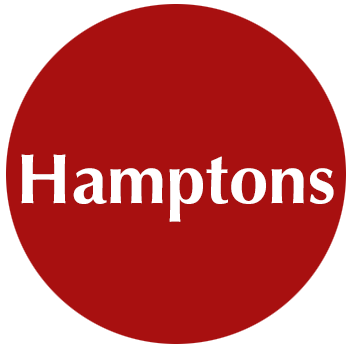 Transitional and contemporary interior designers are innovators who create spaces that appear effortlessly livable. 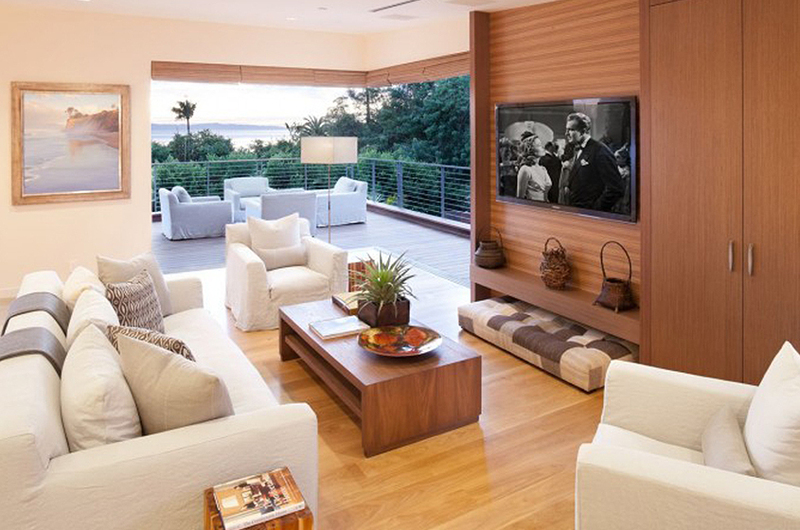 When done well, as seen here, rooms possess sophistication, personality and tons of style. These examples below demonstrate what our network of acclaimed interior designers have done for past clients. 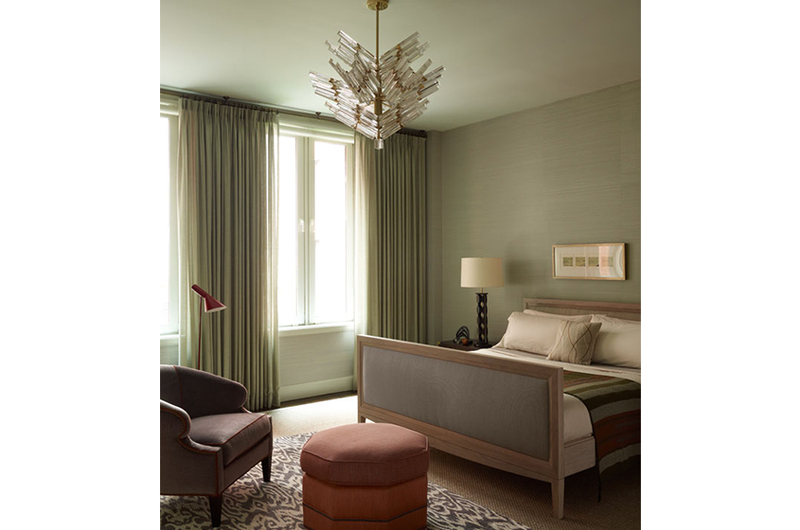 A Tribeca, New York, master bedroom that balances a masculine/feminine aesthetic. A good example of transitional design with a vintage chandelier serving as the focal point with a contemporary patterned silk rug underfoot. 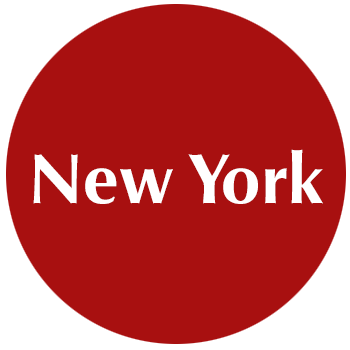 In New York City, on Sutton Place, a pied-à-terre with fantastic views of the city. The mix of velvet, leather, and silk upholstery bring a layered and warm atmosphere to the living room. 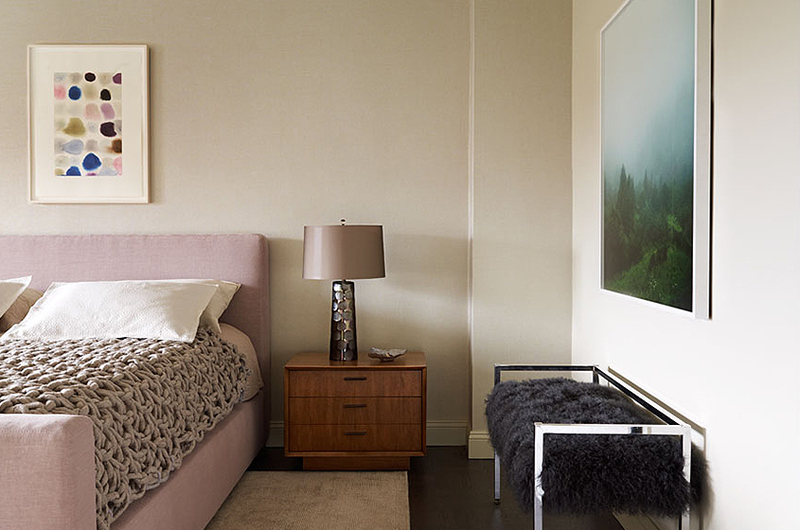 In this contemporary design example on Sutton Place, the pale hues taken from the artwork, a watercolor, and color photograph, are incorporated into the fabrics to make the bedroom peaceful. The hand woven blanket brings texture, as does the sheepskin bench. 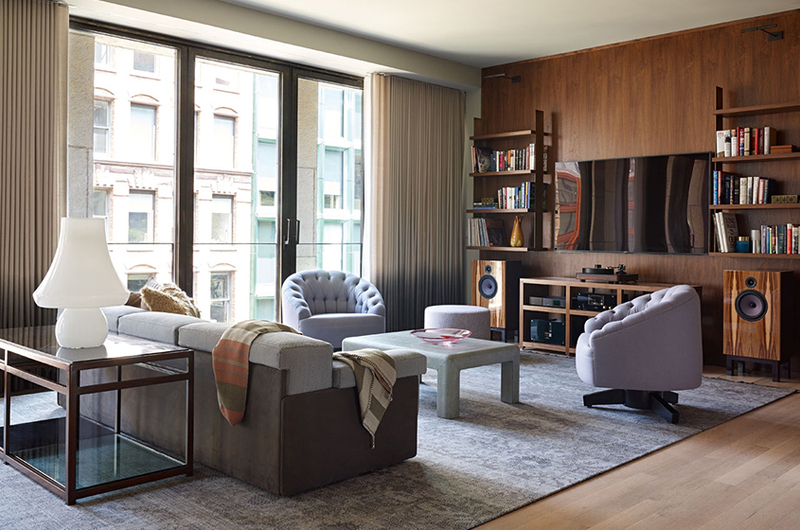 Walnut paneling and stylish speakers exude a masculine vibe in this Bond Street media room, balanced with lavender upholstered tufted swivel chairs, and two-tone fabric on the sofa. A hand dipped ombre textile bring a custom crafted element. 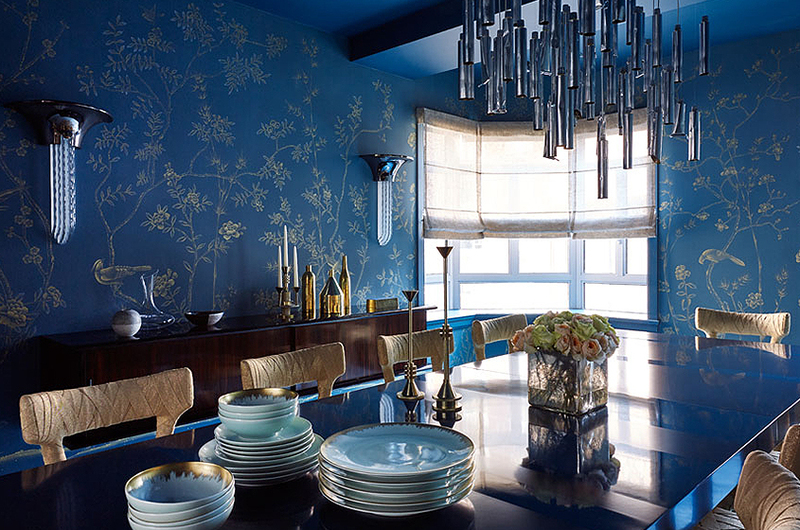 The mood of this New York City dining room is defined by the richly hued De Gournay wallpaper. The counterpoint is established with Mummy Chairs (from Italian company, Edra) of multiple layers of woven fabric in a gold hue. The custom contemporary dining table displays contrasting matte and glossy lacquer finishes. This master bedroom features hand embroidered wallpaper and a pair of elegant glass pendant lights at each bedside. 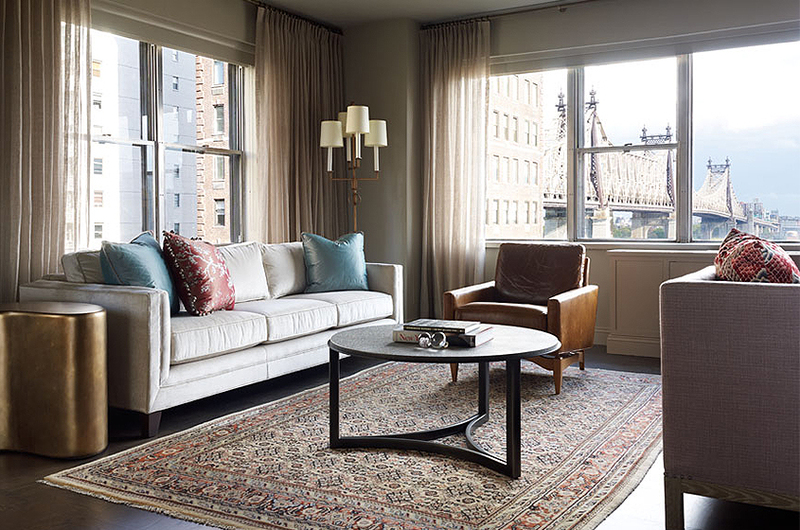 Brass accents and a custom silk rug bring warmth to the palette. Elegance in a children’s room: The custom millwork creates a reading nook in a bedroom shared by two young girls. 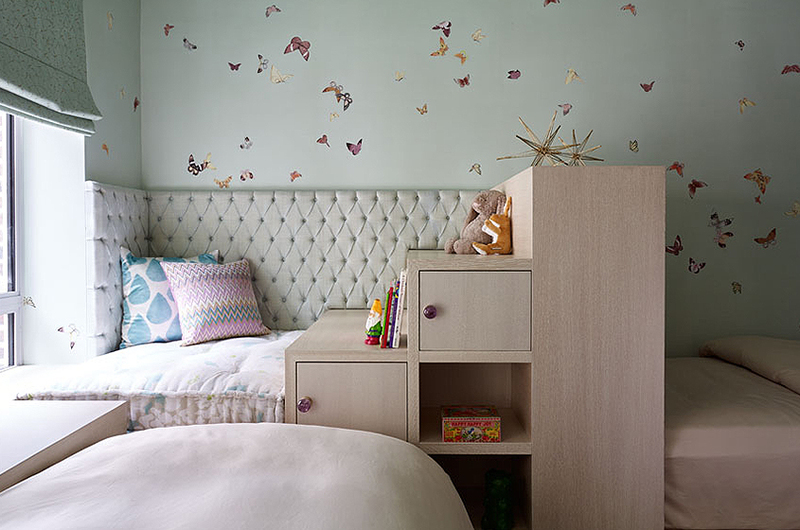 Hand painted butterflies surround the walls and ceiling. 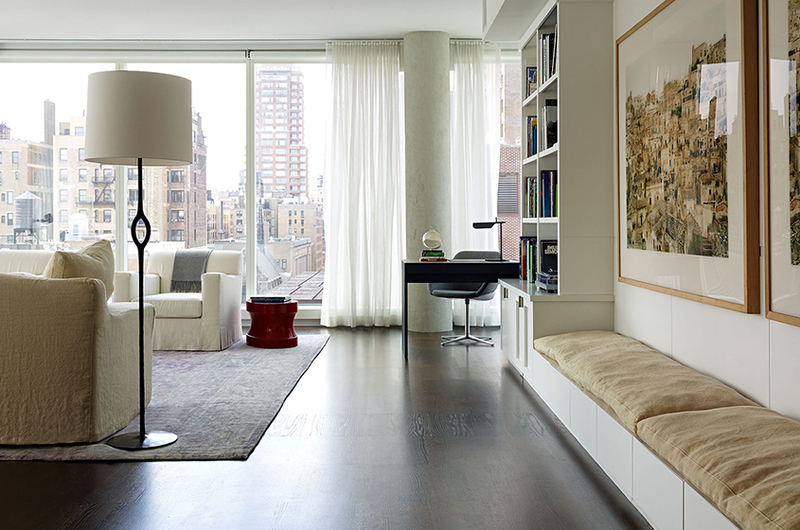 A crisply tailored Upper East Side apartment balances the drama of strong New York City views. 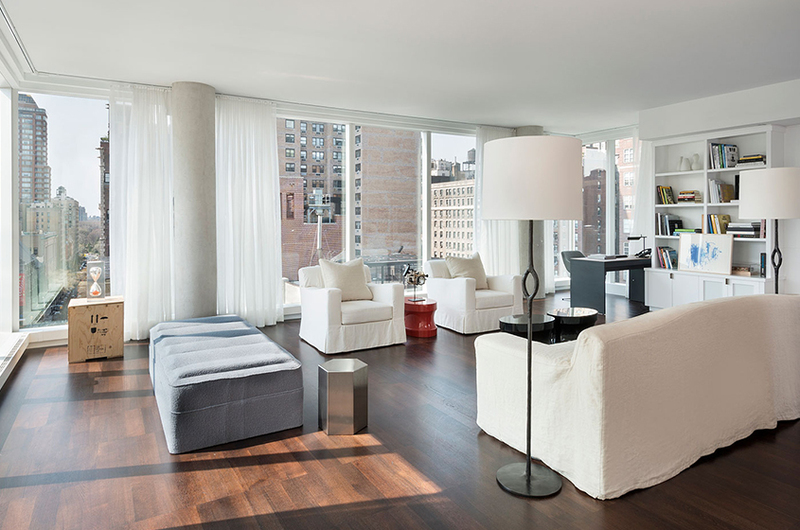 Dark stained floors ground the white sofas and neutral fabric on the long bench. The owner of this contemporary apartment wanted a clean but warm and comfortable look. Sheer draperies soften the natural light. At the Breakers in Palm Beach, Florida, this contemporary guest room/library includes an antique chaise and modern game table. The custom L-shaped sofa, topped with colorful pillows from Holly Hunt and Bergamo, becomes a bed. The walls are constructed with sustainable bamboo veneer. 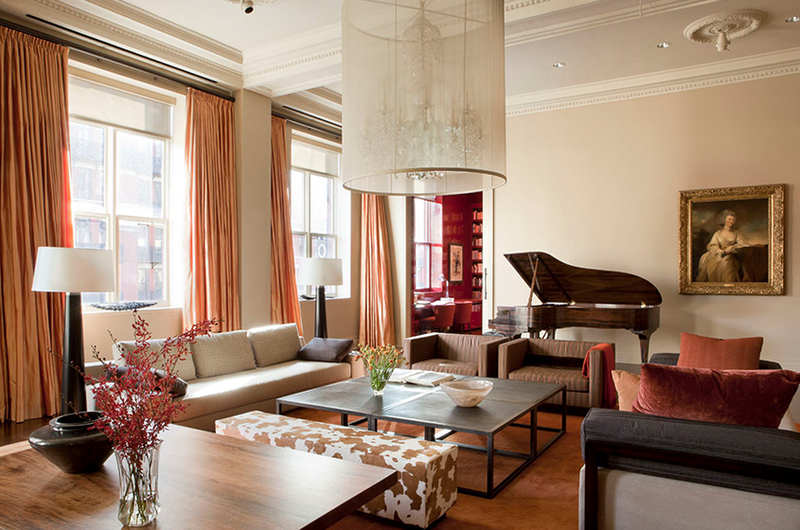 This light-filled transitional New York City loft in the Chelsea neighborhood combines sleek modern furniture with the ultimate traditional accessory – an 18th century portrait- as well as a grand piano. What’s better than having a serene retreat for a bedroom in a bright New York City loft? 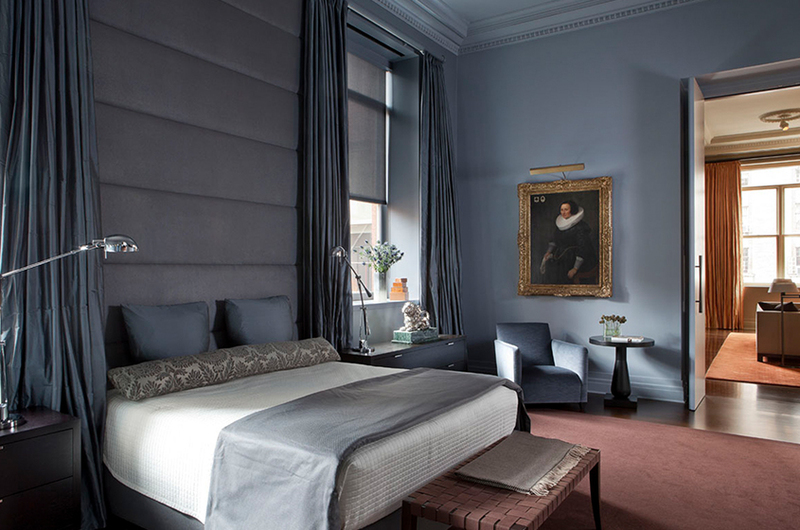 This master bedroom features a William Van Vliet (1584-1642) painting, ‘Portrait of a Lady.’ The color palette of soft gray-blue creates a calm atmosphere. 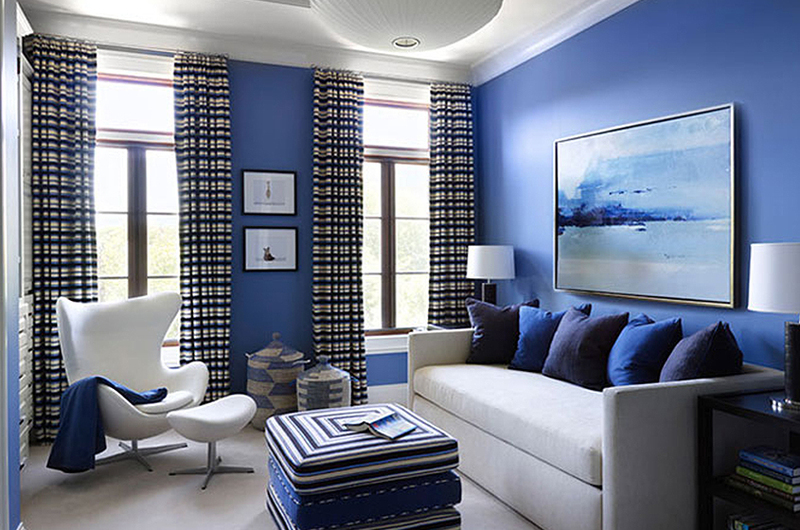 This bright, contemporary room is accented with colorful touches. A George Nelson light fixture and Arne Jacobsen Egg Chair are combined with custom furniture. 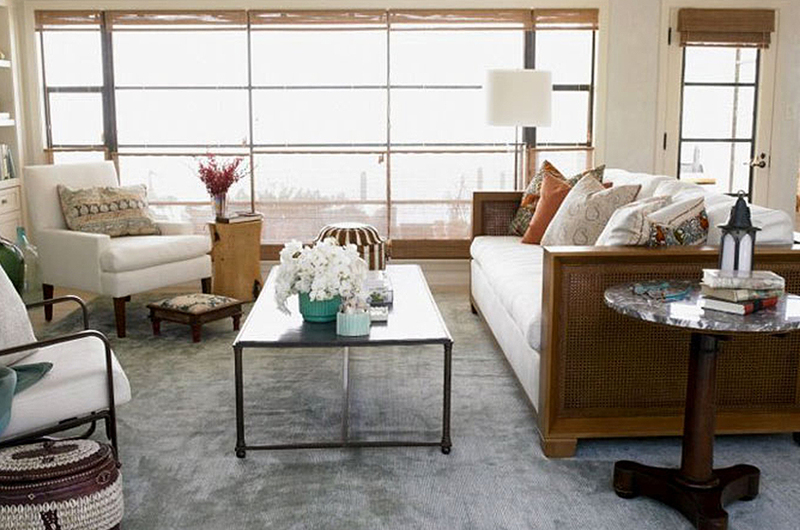 The punch of horizontal stripes on the window treatments creates an exciting and lively space. 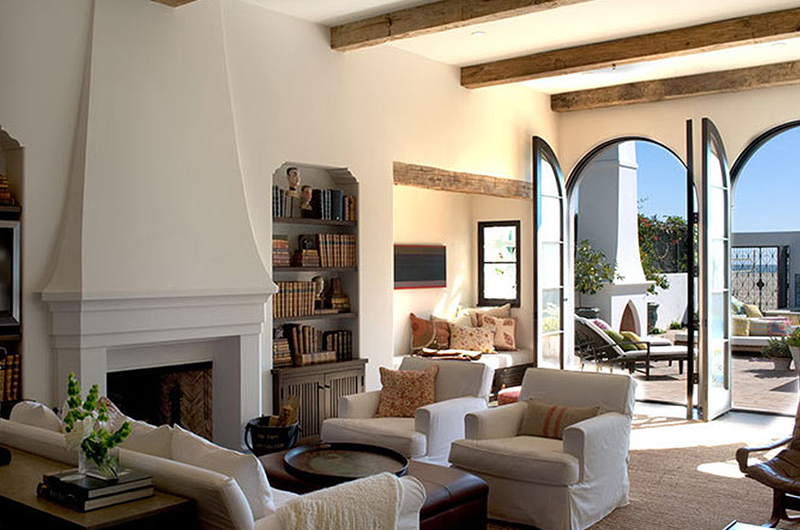 Crisp white sofas are juxtaposed with old wooden beams and antique leather bound books in this airy Los Angeles transitional home on the beach. A large wood and woven sofa outfitted with white cushions, and upholstered white chairs, lend this room a casual look, but give it ample comfort and warmth. The classic bones of this Los Angeles house were respected with use of a transitional interior design. Our designer used clean lined furniture, natural linen, and black and white photographs to balance old and new and assure the space impart a sense of comfort and ease. The carpet and draperies lend the room an informal elegance. 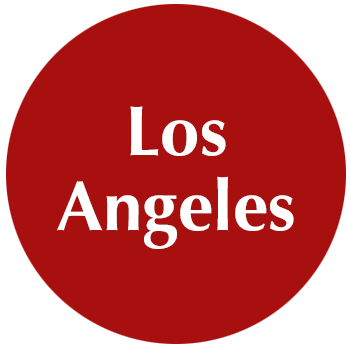 This Los Angeles, Spanish Colonial style home on a bluff, overlooks the beach. 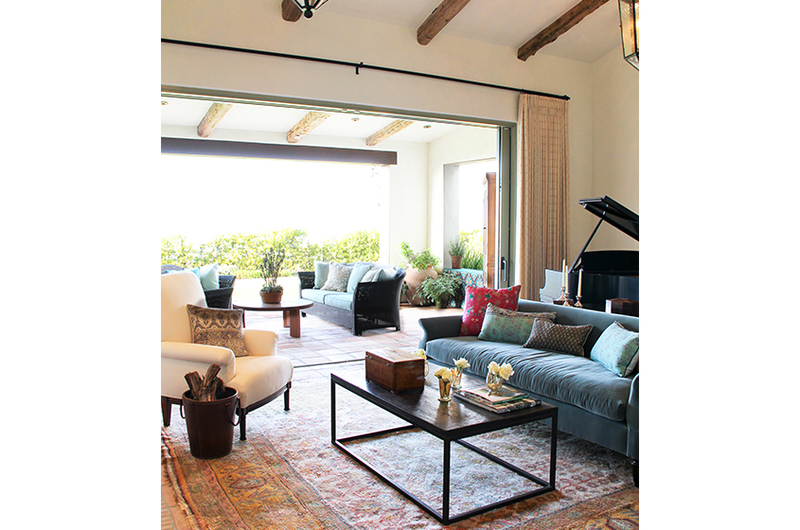 Interior and outdoors spaces are connected by the matching colored sofas and the exposed beams. 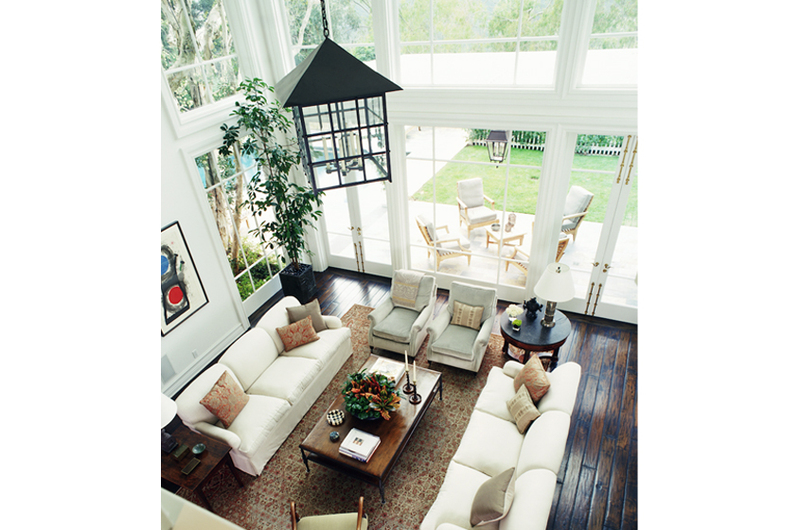 An airy, contemporary Beverly Hills, California, living room with a double height ceiling features cream colored linen sofas. The space is subdued with side chairs upholstered in a delicate pale green and a beautiful antique rug. A large custom black iron pendant lantern illuminates and adds drama to the space. Custom furniture draped with white Belgian linen is juxtaposed with natural wood, both inside and out, in this contemporary LEED certified house in Montecito, California.